I have not posted for a while because I my time has been largely taken up with preparations for Scoil na gCláirseach next month. As well as corresponding with attendees, and dealing with the hydra-like timetable, trying to corral all the different tutors, speakers and other events into some kind of order, I have been preparing for my own presentations. 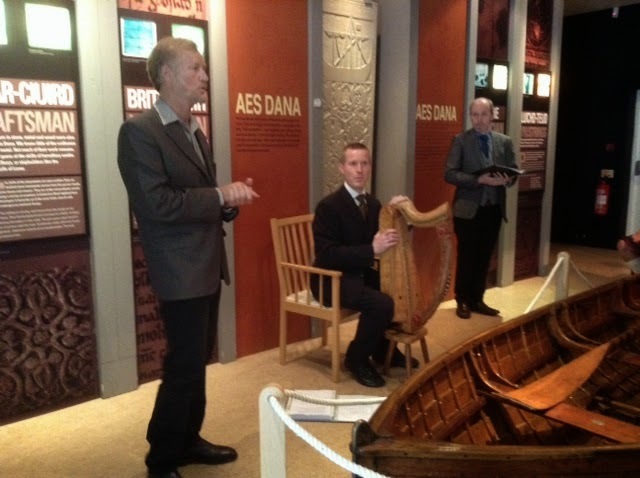 This year, as usual I am leading the ever-popular field trip, where we visit all of the historical Irish harps in Dublin museums, and also presenting the very challenging one-hour overview of the entire tradition. This is pretty tough, trying to boil down everything to its essence. I have been working on a new handout, a kind of map or venn-diagram of the repertory, trying to illustrate the nature of the core repertory and peripheral stuff, and to categorise the core repertory – I think that what survives is in some ways not at all representative of what was played in the old tradition. I am also leading two specialist sessions. 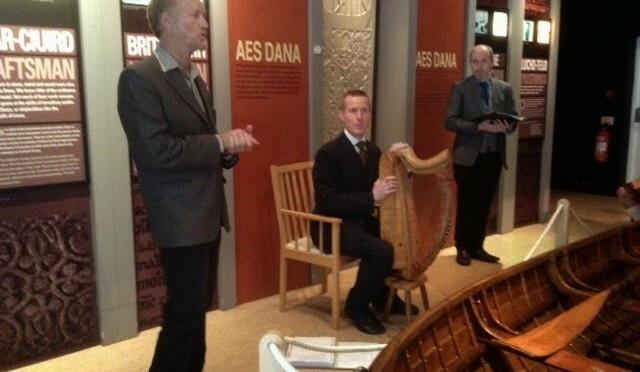 I am giving a presentation on my work researching the music and traditions of Raghnall Mac Ailein Òig, which should be a great opportunity for me to refine my ideas on him. I did some more digging on his journey to Achnacarry to visit Cameron of Locheil – I have still not managed to locate the River Sgaitheal, but I did enjoy a digression reading all about Glen Pean. 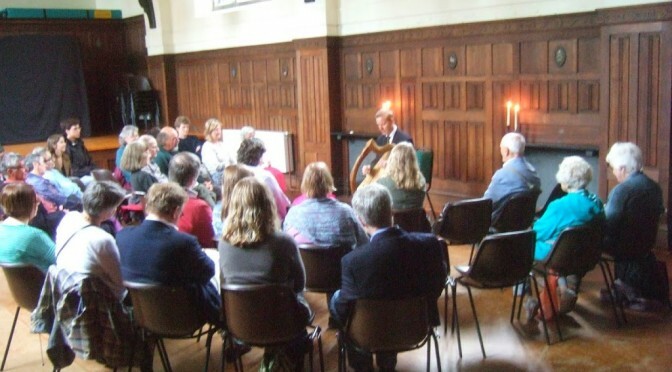 Also I will be chairing a seminar on the Cloyne harp; we will have two different chromatic Irish harps on site, so this seems a great opportunity to get everyone together to discuss this difficult and intriguing subject. Here’s a rather fuzzy photo of today’s concert. I enjoyed having the candles lit! 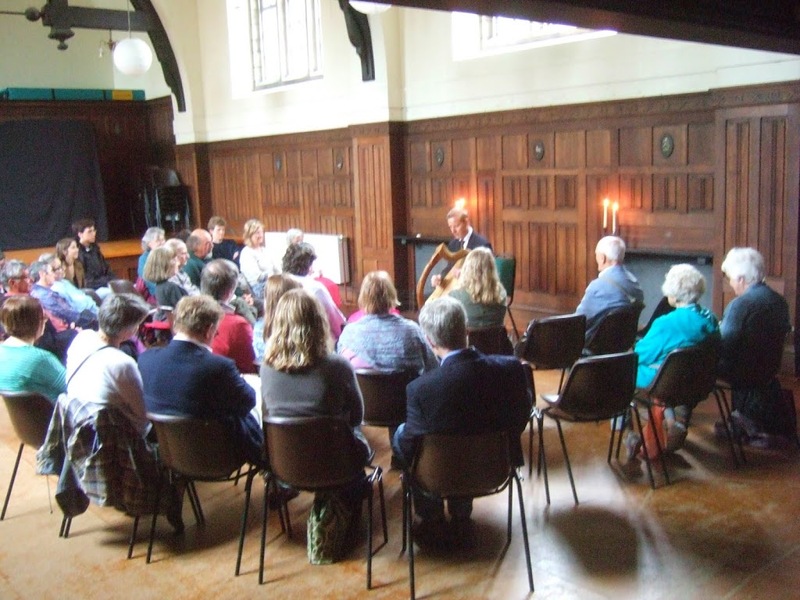 We had a reasonable turnout and the music went down well – two of Ranald‘s tunes from my Tarbh CD. The crowdfunding at Indiegogo finishes tonight – last chance to tip a few pennies in the hat!